MATH MONTHLY Color by Code BUNDLE - ALL MY Color by Code: MONTHS COLLECTION! 6 puzzles – Multiply within 100. 4 puzzles – Divide within 100. I include the puzzles in black and white. I also include a full color version of each puzzle. In order to suit everybody´s needs I also include the answer keys in black and white, and in color too. That makes a total of 40 pages. 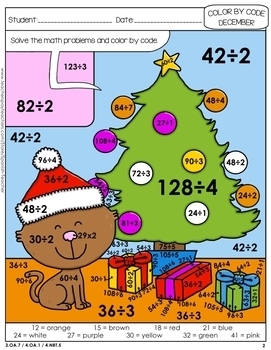 3 of the puzzles are about Christmas. The rest are of typical December scenes. 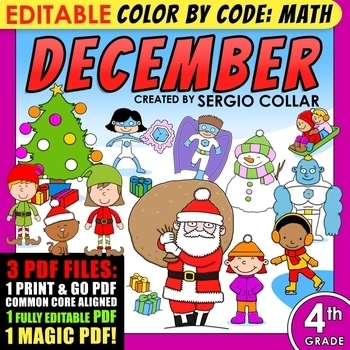 **** PLEASE DO NOT BUY this material if you bought “Color by Code: Math – DECEMBER – 3rd Grade - Common Core Aligned”. Both materials are very similar. *You can check my Pinterest Boards for more cool materials!